Terms system and control volume are very familiar to the one who has studied thermodynamics. The word system refers to a fixed mass with a boundary. However, with time the boundary of the system may change, but the mass remains the same. The usual example given is that of a piston-cylinder arrangement as shown in Fig.3.12. Consider a gas filled in the cylinder which is closed by a piston at the right hand end. Let us define gas as our system. If the piston is now operated by pushing or pulling it the gas compresses or expands. The boundary of our system moves. But the mass does not move out of the boundary since by definition system is a fixed mass. The definition does not prevent work or energy crossing the boundary. It is easy to analyse the system in the example of piston-cylinder arrangement that we have considered before. But the question is - Are all systems as simple as this? The answer is obviously a "no". In fluid dynamics we consider systems which are far more complicated. Take the flow about an aeroplane for example. If we define a system in such a flow and try to analyse it we find that it undergoes many changes as ilustrated in Fig. 3.13. The boundary changes rapidly and undergoes unmanageable distortions. The system approach is almost ruled out. The other examples are flow through turbomachinery, flow in hydraulic systems and many such. The other method we have is the Control Volume approach. Here we do not focus our attention on a fixed mass of fluid. Instead we establish a "window" for observation in the flow. This is what we call the control volume shown in Fig. 3.14. As against the system, a control volume has a fixed boundary. Mass, momentum and energy are allowed to cross the boundary. We perform a balance of mass, momentum and energy that flow across the boundary and deduce the changes that could take place to properties of flow within the control volume. The shape of the control volume does not change normally. It is easy to visualise that this is a convenient approach. in fact, it is the one that is commonly used in fluid dynamics. We will consider a fixed control volume most of the time. But it is possible to have control volumes that change their boundary, those that deform etc. Obviously, these lead to more complicated equations. Examples of such control volumes are given in Fig.3.15. 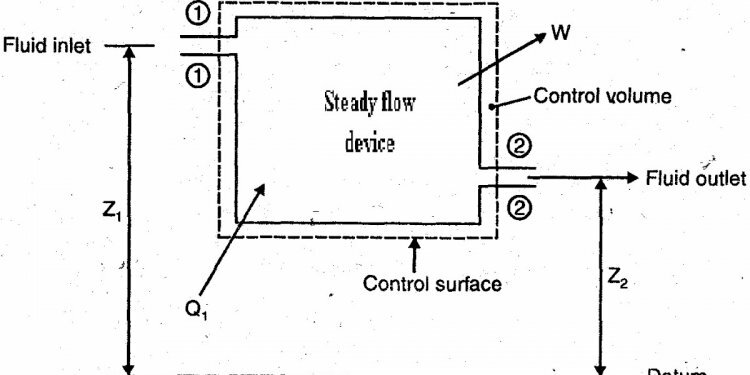 The boundary of the control volume is referred to as control surface. From the above discussion it is clear that the system and control volume approaches are akin to Lagrangian and Euler approaches.